Everyone knows as a matter of common sense, each of us are made vulnerable by what we should but didn't know. This work by the REAL HANSHI OF CENTRAL PARK, a living legend who cleaned up the streets of New York City in perhaps the worst times inthat City's rough past, is therefore a must read. Hanshi Stephen Kaufman is without a doubt one of the world's leading Martial Arts educators and this book proves it. His past work on Musashi and Sun Tzu have propelled him into the realm of masters for required reading and study. Learn from this living master. 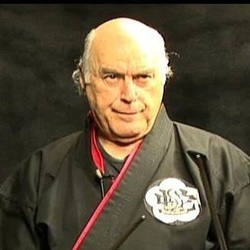 Hanshi Kaufman is an educator, writer, and world recognized martial arts expert. We are fortunate to have an individual like Kaufman in the martial community around the world. With his training and life experience, he has put together a comprehensive martial arts book of simple, easy to learn, step-by-step self-defense principles that men and women of all ages, without any martial arts training, can easily master. In today’s world of terror all around us, Kaufman’s teachings are essential for the simple preservation of anyone’s life. I recommend this book to people in the general population. It will heighten your sense of awareness of the simple little things you can use to defend yourself. Kaufman’s tutorial should be required reading and study for everyone on the planet. I endorse this book, totally and without reservation. Ous, Hanshi, ous! Hanshi Kaufman's Guide to Ultimate Self-defense is for anyone interested in learning correct and effective self-defense strategies and methods based on realistic ideas of safety awareness and self-preservation. There are no tricks taught or used. Instead, effective technique explained in-depth verbally illustrates the correct attitudes to maintain while you are learning. Leaving nothing to chance, important points are stressed with many "street smarts” tips. Attackers or muggers look for easy “marks" or signs of weakness before attacking as considerations for a potential victim. These people are generally “bullies,” but you can easily stop them if you keep your wits. Develop an aura and carriage of poise and self-respect, and strive to be aware of the manner that you represent yourself in all situations. Visualize these practice attack scenarios in your mind and accept the idea that you are going to practice with intent and firm conviction. Visualize the attack, visualize the defense, and then do it. Accept as a personal truth that you act quickly and with resolve. Read the descriptions thoroughly so you can understand it before beginning the tactic you will employ. While it may not be practical to actually scream if you are working out in your apartment, emphasize the idea by screaming with your mind and slightly grunting as you complete the steps in each set of techniques. Do the above; you will be astonished and amazed at the results. Acknowledged as a true Founding Father of American Karate, I was elected to the title and rank of Hanshi, 10th Dan, the most prestigious accomplishment in the martial arts world, by international peer associations in 1991. My martial arts system is recognized by leading world martial arts master to be one of the most realistic warrior methods in the world. I have received countless awards and honors for my work, including the Platinum Lifetime Achievement and Platinum Martial Arts Pioneer Award denoting 60 years of service to the arts by significant organizations.